Disillusioned with how Filipinos in the Philippines were regarded as second-class citizens in institutions of learning and elsewhere, the National Hero Jose Rizal left the country in May 1882 to pursue further studies abroad. He enrolled in a course in medicine at the Universidad Central de Madrid in Spain. In June 1883, he traveled to France to observe how medicine was being practiced there. After his three-month sojourn in France, Rizal returned to Madrid and thought about publishing a book that exposed the colonial relationship of Spain and the Philippines. This idea was realized in March 1887, with the publication of the novel Noli Me Tangere in Germany. Rizal was actively involved in the Propaganda movement, composed of Filipinos in Spain who sought to direct the attention of Spaniards to the concerns of the Spanish colony in the Philippines. He wrote articles for publications in Manila and abroad; convened with overseas Filipinos to discuss their duty to the country; and called on Spanish authorities to institute reforms in the Philippines, such as granting freedom of the press and Filipino representation in the Spanish Cortes. Rizal returned to Manila in August 1887, after five years in Europe. However, his homecoming was met by the friars’ furor over Noli Me Tangere. The Archbishop of Manila issued an order banning the possession and reading of the novel, an order that was later reinforced by the governor-general. 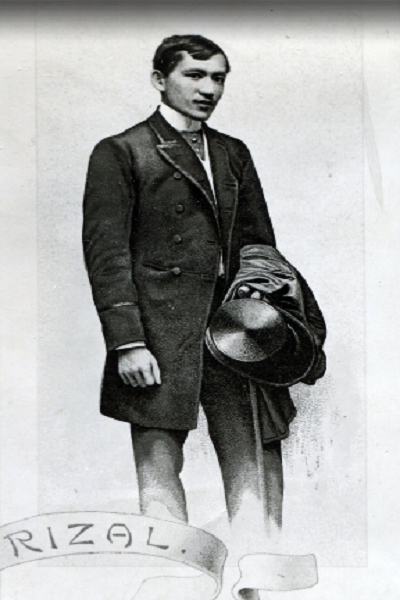 Six months later, pressured by the Spanish authorities as well as by his family and friends to leave the country and avoid further persecution, Rizal left Manila for Hong Kong. From Hong Kong, Rizal traveled to Macau and Japan before going to America. Entering San Francisco, California, in April 1888, he visited the states of Nevada, Utah, Colorado, Nebraska, Illinois, and New York. He jotted down his observations of the landscape in his diary. Rizal arrived in England in May 1888. In August, he was admitted to the British Museum, where he copied Antonio de Morga’s massive study of the Philippines, Sucesos de las Islas Filipinas, which Rizal later annotated for publication “as a gift to the Filipinos.” In the museum he devoted his time reading all the sources on Philippine history that he could find. He kept up his correspondence with various people, including his family, who were being oppressed by the Spanish religious landowners; the Filipino patriots in Spain; and his Austrian friend, Ferdinand Blumentritt, with whom he planned to form an association of Philippine scholars. From 1888 to 1890 he shuttled between London and Paris, where he wrote ethnographic and history-related studies, as well as political articles. He also frequently visited Spain, where he met with fellow Filipino intellectuals like Marcelo H. del Pilar, Mariano Ponce, and Graciano Lopez-Jaena. In March 1891, Rizal finished writing his second novel, El Filibusterismo, in France. He planned to publish the book in Belgium, but was financially hard up. His brother’s support from back home was delayed in coming, and he was scrimping on meals and expenses. Finally, in September 1890, El Filibusterismo was published in Ghent using donations from Rizal’s friends. Meanwhile, a rivalry had ensued between Rizal and del Pilar over the leadership of the Asociación Hispano Filipino in Spain. Rizal decided to leave Europe to avoid the worsening rift between the Rizalistas and Pilaristas, and to help maintain unity among Filipino expatriates. After staying for some time in Hong Kong, where he practiced medicine and planned to build a “New Calamba” by relocating landless Filipinos to Borneo, Rizal came home to the Philippines in June 1892.